Luxi fonts copyright (c) 2001 by Bigelow & Holmes Inc. Luxi font instruction code copyright (c) 2001 by URW++ GmbH. All Rights Reserved. 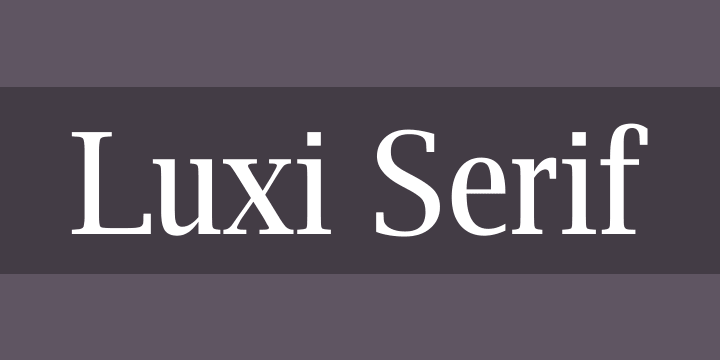 Luxi is a registered trademark of Bigelow & Holmes Inc. The above copyright and trademark notices and this permission notice shall be included in all copies of one or more of the Font Software. The Font Software may not be modified, altered, or added to, and in particular the designs of glyphs or characters in the Fonts may not be modified nor may additional glyphs or characters be added to the Fonts. This License becomes null and void when the Fonts or Font Software have been modified. THE FONT SOFTWARE IS PROVIDED “AS IS”, WITHOUT WARRANTY OF ANY KIND, EXPRESS OR IMPLIED, INCLUDING BUT NOT LIMITED TO ANY WARRANTIES OF MERCHANTABILITY, FITNESS FOR A PARTICULAR PURPOSE AND NONINFRINGEMENT OF COPYRIGHT, PATENT, TRADEMARK, OR OTHER RIGHT. IN NO EVENT SHALL BIGELOW & HOLMES INC. OR URW++ GMBH. BE LIABLE FOR ANY CLAIM, DAMAGES OR OTHER LIABILITY, INCLUDING ANY GENERAL, SPECIAL, INDIRECT, INCIDENTAL, OR CONSEQUENTIAL DAMAGES, WHETHER IN AN ACTION OF CONTRACT, TORT OR OTHERWISE, ARISING FROM, OUT OF THE USE OR INABILITY TO USE THE FONT SOFTWARE OR FROM OTHER DEALINGS IN THE FONT SOFTWARE. Except as contained in this notice, the names of Bigelow & Holmes Inc. and URW++ GmbH. shall not be used in advertising or otherwise to promote the sale, use or other dealings in this Font Software without prior written authorization from Bigelow & Holmes Inc. and URW++ GmbH.